« Economic Morons in Europe, but is Congress Much Better? I find your post oddly comforting - your thesis is basically that after a few years of turmoil, the market will sort itself out, as it did after the shocks of the 1970s. However, those shocks were geo-political; whereas, as you note, the current shock is supply and demand related. Now it's possible that there remain oceans of oil under our feet and if the political players would get out of the way, those oceans could be drilled and supply and demand would get back into gear. But many geologists believe oil production is basically at its peak, and can only stay at current levels for a few years before declining precipitously. If this decline happens as quickly as some scientists believe, it will be very difficult for the relatively calm scenario you envision (people trading gas guzzlers for more efficient cars, etc.) to take place. Instead, there could be chaos. And you don't even mention the problems caused by the fact that fossil fuels are a component of just about everything we use in modern civilization today, from the keyboard I'm typing on to the cereal I had for breakfast (fossil-fuel-based fertilizers). I like your analysis, and think it's a good one if you were discussing, say, the market for corn. But oil is a special animal, and I don't think your views take that fully into account. I assume, Dan, that you advocate government intervention to prevent the chaos. What actions should the government take? You're incorrect. I don't advocate government action. I think the market is doing what it should be doing - prices are going up and people are shifting to alternates, albeit slowly - as the blog writer notes. However, I don't know if this can be as smooth a transition as he seems to think, and market moves may become even more volatile over time. I think a lot of people are going to get hurt badly, but I don't think there's much the government can do to prevent that. I would say that opening additional U.S. areas to oil drilling makes sense, so that's something the government should do - open them up. But that won't solve the problem -it will just put off the day of reckoning a little. "But many geologists believe oil production is basically at its peak, and can only stay at current levels for a few years before declining precipitously." First, I have heard that one before; several times in fact, and each time they have been proven wrong (remember that guy who started the recurring Peak Oil scare in 1957? Well, he did not predict North Sea Oil, did he?). Second, others disagree (for example, http://www.independent.co.uk/environment/climate-change/oil-shortage-a-myth-says-industry-insider-842778.html). Third, on a longer-than-five-years period, there is no reason why nuclear power cannot take all the slack from declining oil production without much disruption; the only obstacles are political, not engineering. Currently the only strict need for oil products is transport, all other needs (electricity production, for example) could be supplanted by nuclear power. I'm with Dan about the key omission in Coyote's discussion of the oil markets. If you don't look at peak oil, you're missing entirely too much. The reason, for example, that the 1973 oil shock was so dramatic was that U.S. domestic oil production peaked in 1971 ($1.75/bbl, 30% of domestic consumption was imports). Incidentally, even if the U.S. pumped every bit of oil that's supposed to be in ANWR or offshore, it wouldn't make a significant difference, and it certainly wouldn't return us to the 1971 peak. The API (the oil lobby) says this, not just your humble servant. Common sense also says that if we consume roughly 25% of the world's energy, and increase our production by as much as 10% (not likely), we'll only add 2.5% to the world's supply. Anyway, the 1973 oil shock was the first time the U.S. couldn't produce its way out of a shortfall in oil -- and sure enough, the recession that followed was the worst since the Great Depression. Daniel Yergin says that at no time was more than 3% of the world oil supply missing. He also calls this period of hefty oil price increases the greatest peacetime transfer of wealth in history. The Reagan presidency saw reduced oil demand because of the recession, and increased supplies because Alaska's North Slope coincidentally came online then. Inflation went away because Paul Volcker started a recession with Fed monetary policy (prime rate: 21% in 1982!). Master of foresight that he always was, Reagan removed Carter's solar collectors from the White House and rolled back the CAFE fleet mileage standards, because that oil was going to last forever. After all, the globe is just full of oil, sort of like a creamy nougat center. And global climate instability? Ha! Reagan's administration also transformed the U.S. from the world's largest creditor nation to its largest debtor, and transformed the inherited trade surplus into a trade deficit. This is the administration that also created the worst political and financial scandal in U.S. history -- the S&L bailout. One lingering effect: One of the Keating Five (five senators accused of corruption for a part of this scandal) is running for president now. Hint: It's not Obama or Nader. The peak in U.S. domestic oil production was correctly predicted by M.King Hubbert, a Shell oil geologist, who observed that the bell-shaped-curve of production mirrored, with a 40-year lag, the bell-shaped-curve of discoveries. Incidentally, the world peak in discoveries was in the early 1960's. You can look all this up in the March 1998 Scientific American. The article title: "The end of cheap oil." So if the world is not at peak oil now, it's awfully close. Google "peak oil" if you like. As for government actions: With relatively few exceptions, governments are as clueless as the general population about this stuff. Why on earth is the U.S. continuing to build sprawl, a development style that literally sets long commutes and a high demand for petroleum in concrete -- even though the market clearly prefers the pedestrian-friendly, mixed-use alternative? Ya got me, pilgrim. News from the far-flung suburbs, though, is that owners are dissatisfied with the expensive commutes they bought into. They'd sell if they had any equity. See Google news "suburban commute expense" for a several recent stories like this. There are a few enlightened sources of public policy: The Norwegians haven't frittered away their North Sea oil revenues, nor have the Danes (now the world leader in wind power). The Germans are ahead of schedule for having 20% of their domestic power come from renewables. Curitiba Brazil continues to inspire in a variety of ways, including energy efficiency, even though it's had far smaller budgets to spend than its first-world "betters." Nevertheless, public policy, intelligent or clueless is going to have a significant impact in the aftermath of peak oil. If we don't have an alternative to single-auto commuting (70% of U.S. petroleum consumption is for transportation), or better insulation standards for our homes, or some encouragement for less petroleum-intensive agriculture, we're going to be in a world of hurt. A word about agriculture: There's a 15-mile dead zone at the mouth of the Mississippi because of all the petroleum-produced nitrogen fertilizer rinsing off of those Iowa (and other) cornfields. Forty percent of U.S. agricultural income is subsidy, so the subsidy ("Laundering money for Cargill and ADM," says one farmer) is encouraging that petroleum-intensive brand of agriculture. Couldn't we even change this? Apparently not. Closing our eyes and hoping for better, or whistling past the graveyard is going to hurt no matter how we slice it. The "conservatives" reading this may not like mass transit, but it may be as inevitable as death and taxes. And sure, you can have stupid death and stupid taxes, but the opposite is also true. If you get the video "The Power of Community" (http://www.powerofcommunity.org/) you'll see an account of how Cuba handled peak oil. When the Soviets broke up, they were shipping Cuba 13,000 tons of oil annually. This went to four virtually overnight. From 1990 - 94, Cuban GNP declined 34% (almost exactly the U.S.' experience from 1930 - 34). and the average adult Cuban lost 20 lbs. Many of them did get in shape as they began riding bicycles, though...8^) The Cuban government said anyone who wanted to leave the island could leave (hence the influx of Cubans to the U.S. and elsewhere in the early '90's), and continued to supply free education and medical care to an extremely stressed population. The kindly U.S. tightened its sanctions, hoping to persuade the Cubans to depose Castro. Oddly, the Cubans interviewed in the video don't appear to hold a grudge. There is some comfort to be found in this post, although I don't find Warren emphasizing it, but rather simply pointing out the inevitable corrections one could expect if market forces were left to operate without intervention. I'm optimistic about the overall timing and effects of this price surge for two reasons, both of which potentially herald solutions that will see us through the middle term when adjustments must be made in energy sourcing. The first is simply that the steep price surge has stimulated development across the board in new sources of all forms of energy without (as yet) the intrusion of too much government mismanagement of any combination of them (although the politicizing of ethanol may come close). The second reason for mild optimism, again focused on government influences, is that a trend toward deregulation is evident in fields as varied as nuclear power and petroleum exploration, extraction, and refining. These trends are essential to avoid a crash, and I'm hoping they become structural in time to avoid a catastrophe. There is no ultimate shortage of hydrocarbons, nationally or internationally, that would by itself and without government assistance, create a collapse of society in the short to midterm. In short, I view the surge as a wakeup call, and I don't think we've overslept. Yet. This seems germane (from http://www.huffingtonpost.com/david-fiderer/why-mccains-drill-here-dr_b_109449.html) The author was a banker covering the energy industry for several global banks for more than 20 years in New York. He is trained as a lawyer. There were two reasons why the Truth-O-Meter at CQ Politics gave a "FALSE" rating to John McCain's "drill here, drill now" proposal for reducing oil prices: supply and demand. The impact on supply, achieved years after oil companies greenlighted any new development projects, would be at most "a couple of hundred thousand barrels a day" or about the same amount that Saudi Arabia promised to add in the next few months. That's well below 1% of today's global production. The impact on satisfying new demand, driven primarily by economic growth in Asia, would be nothing more than a rounding error. McCain's rhetoric on global oil, and the mainstream media narrative, seems stuck in the mid-1980s, when the U.S. produced as much oil as Iran, Iraq, Kuwait and Saudi Arabia combined. Things were far simpler in 1986, when Saudi Arabia racheted up its oil production to 5.2 million barrels a day, up from 3.6 million daily barrels in 1985. Oil nosedived from $28 a barrel in 1985 to $15 a barrel a year later. But those days, when our good friends the Saudis could easily turn on the spigot to change the supply/demand balance, are long gone. To understand oil prices today, you need look beyond the U.S. and the Persian Gulf, to places where the U.S. has limited influence, places like Nigeria and China and Mexico. And until we start dealing with the basics of global supply and demand, our political dialogue will be clouded with more empty rhetoric. Back in the 1980s, when three broadcast networks dominated the news business and three Detroit companies dominated automobiles, the majority of the world's oil production came from three major sources, the Soviet Union, the U.S. and the Middle East. But the U.S. oil production has experienced a long steady decline, one comparable to the declines experienced by the networks and the auto companies. After Communism collapsed, so did oil production in the former Soviet states, although things turned around beginning in 2000. Up until a few years ago, most of the growth in global oil production came from the Middle East. Saudi Arabia's announcement that it may increase its daily production by 200,000 to 500,000 barrels was greeted with great fanfare in the press, but as the Financial Times rightfully pointed out, those gains could be wiped out by political violence in Nigeria. According to the BP Statistical Review of World Energy June 2008, the source of all numbers used herein, Saudi production in 2007 declined by 440,000 barrels a day when compared with 2006. Also in 2007, Saudi consumption of oil increased by 148,000 barrels a day from a year earlier, the biggest increase of any country other than China and India. In other words, we cannot count on the Saudis to provide any solutions to global shortages. Here are some basics known to everyone in the oil industry. Many of the world's top oil producers have experienced declining or stagnant production. Natural declines: North Sea oil production (Norway and the UK) has been falling off precipitously. As is true everywhere, the oil in the ground is finite and it comes out at a much faster rate in the early years of a well's productive life. No one anticipates that this natural decline will be reversed. The same applies to Indonesia and, many believe, Saudi Arabia. Lack of investment and mismanagement: The national oil companies of Mexico and Venezuela have their investment budgets set by the government. Because of a lack of investment and poor management, those countries have been unable to exploit there domestic reserves efficiently. Petroleos de Mexico is forbidden by law to enter into joint ventures with large private oil companies that could share access to the latest most sophisticated technologies. About 10 years ago, Petroleos de Venezuela had independent management and was considered one of the best run oil companies in the world. But Chavez replaced management with his cronies, and the company's operations have deteriorated. Political instability: Rest assured, Exxon desperately wishes that our government. could exert more influence in Nigeria, the single country where it produces more oil than anywhere oustide the United States. Nigeria is case study in what can go wrong when a country fails to use its mineral wealth to promote a greater social good. And of course, there are a number of other countries that have not begun to attain their potential in terms of oil production because of a combination of local mismanagement and political instability, i.e. Iraq, Iran, Sudan and elsewhere. Where is oil production ascendant? As you can see, countries that make up the former Soviet Union (Russia, Azerbaijan, Kazakhstan) produced about 1.4 million barrels a day more in 2007 than they did in 2004. This represents a shift of strategic power back to Russia. Putin exerts a stranglehold over Russia's mineral resources and he will not hesitate to use them as a political and strategic weapon. And Russia exerts a lot more influence over its oil producing neighbors than we do. Can the U.S. restore its production to 1980s levels the way Russia has? Not likely. U.S. reserves have been efficiently exploited with the best equipment and technology for many years. Until recently, Russia's oil and gas has been underdeveloped because of lack of investment, backward technology and poor operating practices. Bottom Line on Supply: More than ever, the world is susceptible to supply shocks because of political circumstances over which the U.S. has no control and very limited influence. In 2007, the United States consumed as much oil as the next five largest consuming nations combined. Put another way, 304 million people living in America consumed as much oil as 2.8 billion living in China, Japan, India, Russia, and Germany. The chart below explains the commonly accepted view of the global economy: China and India are the economic engines that have driven both global economic growth and the run-up in all commodity prices. In other words, if we asked China to consume less, we would be shooting ourselves in the foot economically. Not that China, which consumes on a per capita basis a tiny fraction of the oil we do, believes that we have standing to criticize others. China and India have been very willing to do business with countries considered pariahs by the U.S., countries like Iran, Sudan and Venezuela. One trend that we have overlooked: The developed world is taking steps to reduce its consumption of oil. In Germany, where they love cars and love to drive fast on the autobahn, consumption has declined by 9% over a three year period. Since per capita consumption of oil is about 1.3 gallons a day in Germany, compared to 2.9 gallons a day in the U.S., and because the depreciation of the dollar is reasonably correlated to price increases in oil, we are becoming less economically competitive than other developed nations like Germany. What about speculators? This topic warrants another piece for a full analysis, but most of the evidence suggests to me that this hypothesis is overblown. Players like Enron were able to manipulate the price of electricity and natural gas because they figured out how to create and exploit distribution bottlenecks in comparatively small regional markets. It is much harder to have a similarly large impact on the global oil market. The Bottom Line on Demand: In terms of energy security, and in terms of altering the supply/demand balance, our biggest bang for the buck will come from reducing domestic consumption through new technologies. We hesitate at our economic peril. Regarding peak oil: Hubbert's peak oil theory is grossly misunderstood by most anyone who's had to hear people try to use it to make some political point. It's far better to go look at what Hubbert actually predicted and the caveat's he placed on his estimates. I've been involved in the oil business in various aspects since 1981, and I have to say that Hubbert's model, when applied as he intended and when the limits he placed on it are observed has always been remarkably accurate. So why are there claims that Hubbert's theorem has been "proved wrong many times?" Because people grabbed onto the idea to push an agenda and ignored anything in the theory that didn't fit their agenda. That's happening to a large extent today - but Hubbert's theory is still correct, when used properly. First qualification - the area in question has to be well explored, enough so that a reliable reserve estimate can be made. This doesn't mean completely explored, but explored to an extent that the vast majority of the easy to find and produce oil has been found. This doesn't mean that all discoveries have been made, not by any means - but once you have made a significant number of discoveries, and they begin the ordinary life cycle of an oil field (30 - 40 years for all but the Arabian fields) then new discoveries tend to only replace the old fields that are in the process of dying, and don't actually increase your production rate. That's peak oil. You can maintain this peak rate for quite a while if you keep making new discoveries, but at this point you are paddling as hard as you can just to keep at the same point. In the US, for example, all of the wells drilled during the last boom in the early 80's are now dead or dying. That's what oil wells do. The US has to mount a huge exploration boom just to tread water. At some point, the world hits the same wall. Where is that point? No one can say for sure until all corners of the world have been thoroughly explored, and we're not there yet. But we're close. Regarding the North Sea - that's the wrong analogy. You should use Prudhoe Bay, because Hubbert's most famous and most accurate prediction concerned US production. When the US was producing 6.5 million BOPD in the 50's, Hubbert predicted US peak production of approx. 9 million BOPD in 1970, and forecast declining US production from that point forward. Prudhoe Bay was discovered right about that time - but all Prudhoe Bay did was replace the dying East Texas oil field for a while. Now, nearly 40 years later, US oil production is 5 million bopd and falling steadily. (Prudhoe dies completely by 2017, if you didn't know, and it's production is far off it's highs already) Hubbert was exactly right about US production, even though he never predicted the discovery of a new supergiant like Prudhoe. And you may say that the shale oils - such as the Barnett, Haynesville, Marcellus, and Bakken - will change this outlook, but they will not. Those formations are very difficult and expensive to drill, and will require thousands, perhaps tens of thousands of wells. These will take many years to develop, and although the total amount produced should be good, the rate of production will be slow. It means we may have a long, slow gentle slide down, but the US production rate will not go up. The predictions made by Hubbert's equations are extremely accurate for any well defined individual field that has matured, meaning the exploration phase is over and full development has begun. Hubbert's equations also predicted future US production with extreme accuracy when he published in 1956. They worked because at the time the US was the most heavily explored chunk of real estate in the world. When the world has finally been fully explored - and with the move into deep water, we're close - then the prediction for true peak oil, worldwide, can be made. We're probably not there yet - but we get closer every day. Personally, I think it will take only about 4 - 5 years more data to be able to make an accurate calculation, because by then there will have been at least one exploratory rig running in every interesting piece of geology on the planet. One more thing to remember - peak oil is NOT peak gas. Oil and gas, although always lumped together, are two different fuels, two different production curves, two different markets. I still see a great future for Nat Gas, although the price still has a good double left in it before it starts to level out. But we've got a lot of that stuff, especially in Alaska, if we'd just get around to actually building some pipelines to get it. Same goes for the Florida and California coasts. That's where this country's efforts need to be focused. Most of Yoshidadâ€™s post is (as usual) complete economic garbage. 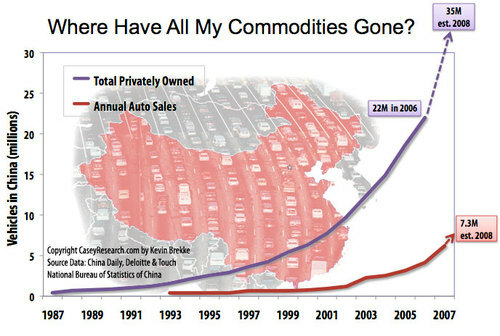 Chinaâ€™s oil consumption has doubled every 10 years. They will easily overtake us next decade. Bad comparison. Germanyâ€™s per capita oil consumption has little to do with economic competitiveness, especially since Germanyâ€™s economy is approximately 1/5th the size of the US, and geographic size is slightly smaller than Montana. Bad comparison. Massively subsidizing economically nonviable sources (wind, solar, etc.) forcing adoption results in massive inefficiencies and competitive disadvantages. Dumb idea. Many (most?) countries (including Germany) exploring alternatives to oil are hopelessly mired in high-tax, high-intervention economically burdensome socialist policies putting them at serious economic disadvantage. Also, from the first post, the trade deficit is not a [meaningful] deficit. One correct point: the influence of "speculation" on oil prices is highly overblown. Do you truly believe that the politicians understand the economics involved here and just want prices to be high for environmental concerns? You give them more credit than I.
WWS does a good job explaining Hubbert's peak. Anyone who's sanguine about oil supplies should read that post. Note that discovery of new oil peaked in the early 1960s and despite nearly 50 years of improving technology has only gone down since then. "While oil prices have gone up by a factor of about four since 1998, copper has gone up by a factor of about 15!" I just stopped reading about there. It's foolproof to say that you know nothing about what's going on. 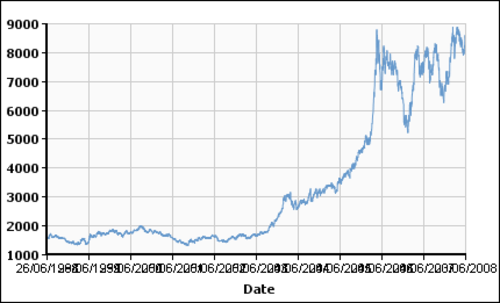 In 1998, oil was at 7-9$. Now, 140$. Divide 140 by four and see if you get 9$, you dolt. Mesa Econoguy says: "Most of Yoshidadâ€™s post is (as usual) complete economic garbage."... and then proceeds to comment about Chinaâ€™s oil consumption, saying "Bad comparison." Sorry Econoguy, no comprendez. I didn't mention China. How is this germane? Incidentally, this is fairly typical for several replies I've read on this blog, too - an unsupported statement or invective followed by irrelevancies unconnected to the previous discussion. I'm just as bad as the next guy at following the thread of reasoning, so I won't complain too loudly, but y'all really need to read what I wrote, not what the voices in your head are saying if we're going to have a conversation. Then Mesa Econoguy says "Germanyâ€™s per capita oil consumption has little to do with economic competitiveness, especially since Germanyâ€™s economy is approximately 1/5th the size of the US, and geographic size is slightly smaller than Montana. Bad comparison." Again, Econoguy, it's not controversial that all of Europe (and Japan) use half the energy the U.S. does per dollar of GDP. Confining this observation to a single economy or country isn't really germane, IMHO. If you've got some other point to make -- besides agreeing that the U.S. is a high-energy-use economy that subsidizes petroleum use orders of magnitude more than it does renewables or things like transit -- then you've got to clarify before I'll be able to get it. Mesa Econoguy says: "Massively subsidizing economically nonviable sources (wind, solar, etc.) forcing adoption results in massive inefficiencies and competitive disadvantages. Dumb idea." But is that dumber than the orders-of-magnitude bigger subsidies for petroleum? Straining at a gnat, swallowing a camel is what I'd call this kind of comment. And subsides = inefficiencies in both our worlds, I'd say. Incidentally, I won't disagree that wind, solar, etc. are not going to have as high a rate of return as petroleum (energy returned on energy invested, or EROEI actually). That's a no-brainer, but doesn't make renewable energy nonviable. Or do you say an infant is "non-viable" because he can't run a decathlon or get one of the really well-paid jobs? Oil has the highest EROEI, without a doubt. It stores the solar energy of millenia, so how could solar for a day or a year be comparable? The real question is not "Why is solar so expensive?" It's "Why is oil so cheap?" The motivation to try something that might be less-than-optimum in the short term is that the oil, or at least the cheap oil, is running out. Google "peak oil" if you don't believe me. -- and the sun and wind aren't running out. Should we have the foresight to build the infrastructure alternative that takes advantage of energy that won't run out before the high-short-term-return one that is running out runs out? And should we send our children out to work in the coal mines because they're not pulling their own weight either? Unreasonable expectations lead to that kind of conclusion. Reasonable people can disagree about how soon their kids should get jobs, what to fund and how much renewable energy we'll need, and how much to encourage conservation. But dismissing all such impulses as "garbage economics" seems extreme, if not extremely short-sighted, to put it mildly. Econoguy again: "Many (most?) countries (including Germany) exploring alternatives to oil are hopelessly mired in high-tax, high-intervention economically burdensome socialist policies putting them at serious economic disadvantage." Of course, and those not exploiting child labor are at (at least) a (temporary) disadvantage because they don't have as much labor at their disposal as those who sanction child labor. Again, this is a fairly short-sighted remark. Public policies (governments) can, and have made important contributions to new discoveries. Oh I know Rush Limbaugh claims only individuals can innovate, but ask him where nuclear energy would be without the Manhattan project, or the internet without DARPA, or semiconductors without NASA, or the 30-year mortgage without FHA, to name a few. Incidentally, the high tax, etc. German state you criticize was put together that way with the consent of the governed when last I checked. Is that not OK? On a smaller scale, could a neighborhood pool its resources and buy a swimming pool, or does everybody have to build their own? IMHO, the difference between the Europeans' willingness to put up with a relatively high tax burden, and the intolerance for that idea expressed repeatedly on this blog, is twofold: 1) Europeans understand that building a public or neighborhood pool is orders of magnitude cheaper than making everyone own a private one (and probably more fun for the kids to play in), and 2) the Europeans see and appreciate real personal good coming from collective action, rather than the toxic waste that the "conservative" U.S. administrations of the last 30 years have made. Actually "toxic waste" is not an accurate description. The average tax burden for most people has risen as, in the name of fostering "growth," taxes have grown less progressive in the U.S. Successive administrations, with the exception of Clinton's, have lowered the top income tax brackets while increasing the payroll tax fourfold. Something like this occurred in Europe too, BTW, but less dramatically. The bankruptcy of this theory of lower-progressive-tax-induced growth is amply demonstrated by the fact that the theory has worked exactly backwards in practice. The high marginal rates of the 1950's (with a 92% top bracket) coexisted with the best GDP growth. The lower rates of recent decades have seen less growth. Q.E.D. Anyway, when people see public policy distorted to favor a few (while median income has stagnated for the last three decades in the U.S., the top .01% of income earners have seen their incomes increase 400% plus) they aren't likely to look kindly on government that is robbing poor Peter to pay rich Paul. This observation isn't my exclusive property. Read David Cay Johnston's "Free Lunch" for many more such tales of woe. Anyway, if the Germans see high taxes bringing benefit to their public realm, then that's their right, isn't it? Or will you compel everyone to adopt your point of view, Econoguy? Econoguy writes:"Also, from the first post, the trade deficit is not a [meaningful] deficit." Wow, a naked, unsupported assertion that has no connection to facts or footnotes, or, as far as I can tell, meaning. Quelle surprise! OK, that was just rude. What I really need to say is this: Econoguy, if you want me to even have the possibility of agreeing with you, you're going to have to explain this further. Econoguy: "One correct point: the influence of "speculation" on oil prices is highly overblown." Nice! See, we're not that far apart after all! "The bankruptcy of this theory of lower-progressive-tax-induced growth is amply demonstrated by the fact that the theory has worked exactly backwards in practice. The high marginal rates of the 1950's (with a 92% top bracket) coexisted with the best GDP growth. The lower rates of recent decades have seen less growth. Q.E.D." Here is a question about a your high progressive tax, lets say if you work the last day of week you could earn another $300. This will get taxed at the 92% rate. So your take home on the $300 is $24. What would you do if something broke in your house that needed to be fixed right away, and you were capable of fixing it? Stay home and fix it your self and for go you $24 income? Or get someone to come in to fix it for $50 and bring home your $24, a net loss of $26 on the day. This would have a huge effect on the economy. Itâ€™s been awhile since Iâ€™ve study GDP numbers, so I might be a little off on this. But if I remember correctly, the service industry numbers are under estimated in the calculation of GDP. The service industry has probably been the fastest growing industry since the 1950â€™s as machines have started to replace people in the work place. So, your GDP growth comparison is useless. Yoshidad, you are an economic neophyte. Your post above contains more errors than I have time to correct. You are also a very poor writer, with typical illogical leftist meandering thoughts instead of concise statement and evidentiary support. I am not here to get you to agree with me, or anybody else; Iâ€™m here to correct your numerous economic misconceptions and factual misstatements, of which you have very many. The high marginal rates of the 1950's (with a 92% top bracket) coexisted with the best GDP growth. The lower rates of recent decades have seen less growth. This is an incredibly stupid statement. What do you mean by "best?" That is economically meaningless. The 1940's and 50's saw dramatic percentage gains in GDP, due to factors such as postwar private sector recovery, demographics, and a variety of other factors (such as size of government, which was not nearly as large as it currently is, though the New Deal had expanded it significantly). It had little or nothing to do with high tax rates, which actually hindered growth, robust though it was. And as we saw during the Carter years, nobody paid those taxes, with enormous loopholes and catches built into the tax code. The average tax burden for most people has risen as, in the name of fostering "growth," taxes have grown less progressive in the U.S.
You should also go here, here and here. But you won't, because you are stupid. Yoshi, most of your statements are economic crap, culled from incredibly ignorant left-wing blogs. I recommend from commenting about matters economic henceforth. Aren't you late for your monthly Leo DiCaprio fan club meeting or something? As Sallie discusses, it is a problem for a democracyâ€“particularly one less constrained by constitutional rules than in the pastâ€“to have such a large and growing share of residents not paying any tax because these folks are unconstrained in campaigning for more benefits for themselves at the expense of others. This is incredibly important, because it is the exact problem of your utopian vision outlined above: once the state takes over, which you fully endorse, you canâ€™t go back. But thatâ€™s entirely unimportant to you, because you think youâ€™re just being a reasonable, responsible, and intelligent citizen, when in fact you know absolutely nothing about economics and liberty. You are the cause of the very problems you seek to eliminate. Don't be so hard on Yoshidad. He is only repeating things he has been told, so in his mind they must be true. Like the peak oil comments above, supporting Hubbert's "theory." The US is almost the only place in the entire world where exploration has been extensive enough to apply the King's ideas. "Peak oil" in Saudi Arabia, for example, is due to poor production and maintenance practises and limited exploration, combined with the desire of the royal family to preserve the wealth for more generations--in lieu of any plans to develop a real economy in the kingdom. At current oil prices, that's $ 7 trillion worth of production that would benefit the American economy, not overseas producers. Calling that an "insignificant difference" is CRAZY - and that's putting it mildly. Master of foresight that he always was, Reagan removed Carter's solar collectors from the White House and rolled back the CAFE fleet mileage standards, because that oil was going to last forever. Reagan was right about that for TWENTY-SEVEN YEARS, which is a full generation. That indeed makes him a Master of Foresight, especially among politicians. Further, he was right about how to bring down the late, unlamented Soviet Union. And global climate instability? Ha! Since nobody was talking about that until six years after Reagan left office, and indeed at the time Reagan was elected the prevailing fear was of a new ICE AGE, to knock Reagan for not being a Global Warming Cultist is both petty and irrational. Reagan's administration also transformed the U.S. from the world's largest creditor nation to its largest debtor, and transformed the inherited trade surplus into a trade deficit. The U.S. is not the world's largest debtor, except in the most crude, basic, and therefore misleading sense. As Thomas Sowell has written, "Donald Trump probably has a bigger debt than I do â€” and less reason to worry about it. Debt means nothing unless you compare it to your income or wealth." As a percentage of GDP, Spain, Italy and Japan are all more indebted than are the U.S. - and all are also going to have far lower economic growth than will the U.S. over the next few decades. Relative demographics guarantee that. As for the trade-surplus-to-debt... That's the fault of American consumers and workers. Are you going to take the average American to task for wanting high pay, (which prices American goods out of reach for most of the world), and low-cost goods, (lately mostly produced by Asia) ? And when you get done upbraiding the American for wanting to be well-paid and yet not wanting to pay a lot for consumer goods, will you then castigate the Chinese, Vietnamese, South Korean, etc., for bettering their lot by meeting a demand ? A person who would do that is at best a self-centered, selfish scold. [Reagan's] is the administration that also created the worst political and financial scandal in U.S. history -- the S&L bailout. The S&L debacle was indeed a horrible political and financial scandal, but let us not forget that it originated in THE U.S. CONGRESS, and so again, blaming it on Reagan is both petty and irrational. Further, calling it "the worst political and financial scandal in U.S. history" demonstrates a lack of knowledge about U.S. history. Why on earth is the U.S. continuing to build sprawl, a development style that literally sets long commutes and a high demand for petroleum in concrete -- even though the market clearly prefers the pedestrian-friendly, mixed-use alternative? Ya got me, pilgrim. Maybe because the market clearly doesn't prefer urban living over suburban. But, if you're completely convinced that Americans long to live where they can walk to everything they need, then now is an EXCELLENT opportunity to snap up downtown condos almost everywhere for a song. You'll make a killing !!!!! From 1990 - 94, Cuban GNP declined 34% [but Cuba] continued to supply free education and medical care to an extremely stressed population. A) There's rarely such a thing as "free". For instance, in America, students at public schools don't pay a per-head fee, and so it is "free" to them, but anybody who owns or rents housing is paying part of the cost of educating the students. In Cuba, the cost of educating students is similarly borne by the extremely stressed Cuban population. The resources to do so don't just fall from the sky. B) In the Cuba of the 90s, "free" medical care DIDN'T INCLUDE MOST DRUGS, which not only had to be paid for, but COULD NOT BE PURCHASED USING CUBAN PESOS, which tells a thinking person everything they need to know about the Cuban medical system and Cuba in general. "Cubans with access to dollars - typically those in the tourist industry who receive tips in dollars - can obtain the drugs they need. Others have relatives in the United States who can ship them. The rest - middle class Cubans included - must resort to begging, the black market or, increasingly, to prostitution. "Cuba is renowned for having a universal health-care system and, in fact, doctors are plentiful and doctor visits are free. But without access to antibiotics, insulin, heart drugs and other life-saving medicines, doctors cannot perform their duties. Too often, for lack of medicine, doctors have no choice but to amputate limbs, or to put patients through painful therapies without painkillers. In one celebrated case, Dr. Hilda Molina, the founder of Havana's International Center for Neurological Restoration, returned the medals that Fidel Castro had awarded her for her work and resigned in protest, outraged that Cubans were denied critical care..."
MORON, Cuba - In this historic town of 70,000 people in central Cuba, a small bottle of tetracycline costs US$5 and a tube of cortisone cream will set you back as much as US$25. But neither are available at the local pharmacy, which is neat and spotless, but stocks almost nothing. Even the most common pharmaceutical items, such as Aspirin and rubbing alcohol, are conspicuously absent. In their place there is a neat display of green boxes of herbal diet teas from Spain. One of the myths Canadians harbour about Cuba is that its people may be poor and living under a repressive government, but they have access to quality health and education facilities. It's a portrait encouraged by the government, but the reality is sharply different. Still, the residents of Moron are luckier than most Cubans because many of them work in the nearby resorts, where they often receive foreign medications as tips. "We know how difficult life is here, so when we come for a vacation, we always bring a few bottles of antibiotics and Tylenol," says Laura, a housewife from Oakville, Ont., who was recently vacationing at a large resort in nearby Cayo Coco. A 72-year-old pensioner from Toronto who did not want to be identified also said she had arrived for her recent vacation well- stocked with tubes of antibiotic cream, Aspirin, decongestants and bandages. "My doctor in Toronto told me that there is nothing available in Cuba, so I came prepared just in case I needed any of these things for myself," she said. "But I am leaving most of what I brought for the maids and the bartender." [H]ospitals are falling apart, surgeons lack basic supplies and must re-use latex gloves. Patients must buy their own sutures on the black market and provide bedsheets and food for extended hospital stays. But for most Cubans, the question of who is financing health care is rather academic. "We have nothing," said Jasmin, a nurse who lives in Moron. "I haven't seen Aspirin in a Cuban store here for more than a year. If you have any pills in your purse, I'll take them. Even if they have passed their expiry date." This basic information about the Cuban healthcare system was obtained in A MERE TEN MINUTES of web-searching. Is there really any excuse for being so ill-informed as to believe that Cuban medical care should be held out as an example of anything but the total incompetence, brutal callousness and extreme dysfunction of Cuban leadership ?